Be prepared for any emergency by taking workplace approved standard first aid classes. This two day course is the most popular program and it includes training in CPR and AED. Certification is valid for 3 years. 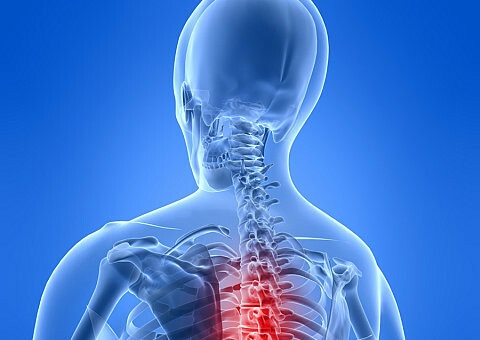 This workplace approved course is equivalent to occupational first aid. After successfully completing this course participants receive a certificate that meets WorkSafe BC standards and is vaild for 3 years. This basic workplace approved first aid class is a one day course designed to teach the basics in rescue and safety skills. 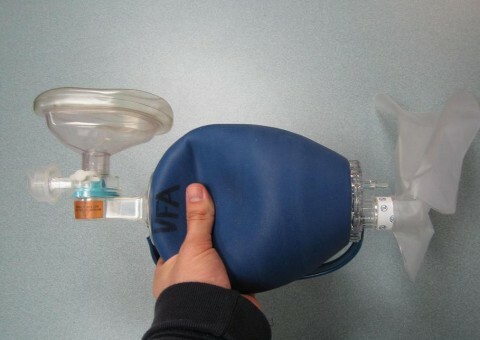 CPR and AED is included. Various CPR level's can be partnered with this course. This course is designed for individuals that work in the childcare or daycare industry. This is also an ideal course for parents who want to prepared for any emergency. CPR and AED is included in this 8 hour course. 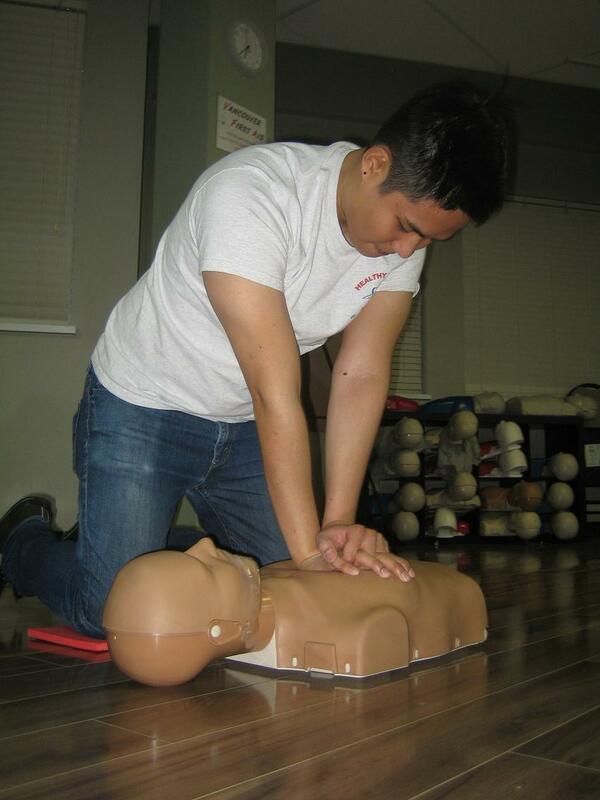 This stand-alone CPR course is one of the most popular workplace approved CPR classes available. Participants learn to rescue victims of all ages in this 5 hour course. 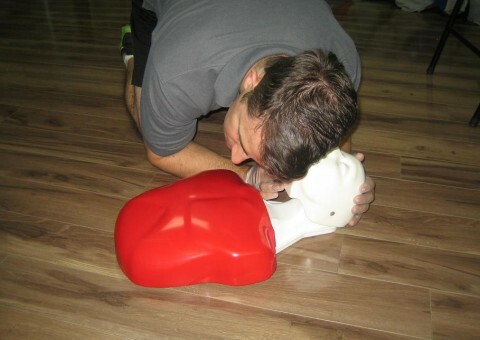 Only CPR certification. This comprehensive stand-alone CPR course is designed for people that work in or want to work in the health care industry. 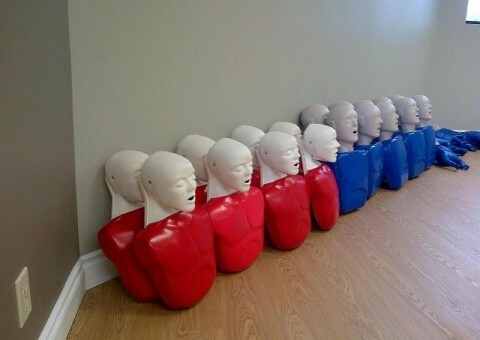 This CPR only class takes approximately 6 hours to complete. AED training included. This is the shortest and most basic CPR course available. Learn to rescue adult victims and how to use an AED. This course takes approximately 4 hours to complete. Certificate valid for 3 years. 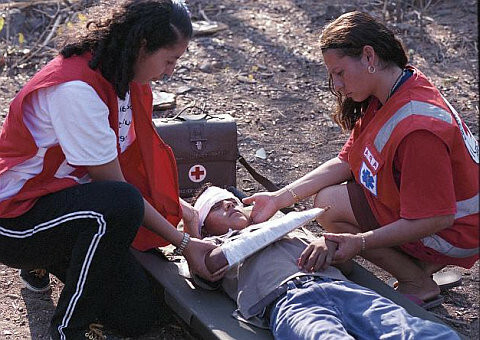 Upon approaching a scene of injury, one of the main things that should be assessed from the casualty by the paramedic, or any clinician with first aid training, are any possible fractures and/ or dislocations. Victoria First Aid is a proud provider of the highest quality workplace approved and food safe programs at the most competitive prices. We are dedicated to having the most experienced and knowledgeable instructors. Our training facilities are conveniently located throughout Victoria and provide a comfortable learning atmosphere. We feature the latest training equipment in convenient and well maintained facilities. Victoria First Aid proudly has exceptionally high customer reviews with courteous and friendly staff. Numerous customer service representatives are available during regular business hours to help with any questions, concerns or registration problems / needs. Registration for any workplace approved first aid, CPR or food safe course can be completed via our on-line registration program (found throughout this website). We also offer re-certification courses for participants that want to renew certificates. Other courses include pet first aid and CPR for individuals that want to learn basic rescue techniques for pet emergencies. If you have a question or concern about any of our programs feel free to use our “contact us” page to email, call or visit us. We look forward to teaching you. All of our first aid courses are provided through a workplace approved provider and adhere to the highest first aid and cardiopulmonary resuscitation training standards as mandated by the International Liaison Committee on Resuscitation (ICLOR). ILCOR is the governing body on standards and techniques for first aid and CPR. 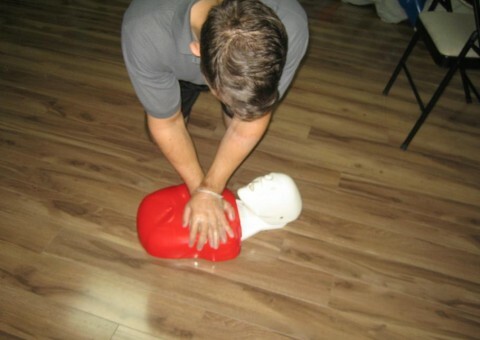 Our first aid classes include certification and education in cardiopulmonary resuscitation (CPR) and in the usage of automated external defibrillators (AED). Upon successful completion of any first aid and CPR course, participants will immediately receive a workplace approved certificate / award that meets a number of certification workplace, school and government standards. This award is valid for 36 months and is applicable throughout Canada. The most popular courses offered through Victoria First Aid are standard, childcare and emergency first aid all of which can be registered for on-line and are offered multiple times per week at various dates and times. For the majority of these courses participants can select the CPR training associated with the course (childcare first aid must be partnered with CPR level “B”). For more information about the available first aid and CPR courses visit the first aid course page. 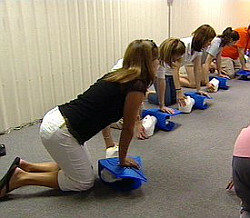 Many customers are required to maintain current first aid and / or CPR certificates. We are partnered through workplace approved providers to offer re-certification courses that provide candidates with renewal certificates that are valid for 3 years and are equal in certification value when compared to the original certificates. To view the available re-certification courses or to register visit our re-certification page. Victoria First Aid proudly offers food safe certification courses. These courses meet all of the government standards and regulations and provide candidates with certificates that do not expire. Participants in these courses will learn basic skills in food health and safety as well as how to prepare, handle, store and manage food. Candidates can register for either food safe level 1 or level 2 courses. For more information or to register for a course visit our food safe course page. Our pet first aid and CPR courses are designed for candidates that want to learn the most up-to-date skills in recognizing and treating pets with first aid and CPR. Candidates will learn these skills through hands on training through knowledgeable instructors and the latest equipment. For more information or to register visit our pet first aid page. We are proud to serve the Victoria area. If you have any questions or concerns, or if you would like to book a private course please use our “contact us” page. We feature a number of stand-alone CPR classes for customers that would like to receive CPR “only” training (includes AED training). These courses do not include any first aid certification and focus strictly on cardiopulmonary resuscitation. Candidates that are registered in these workplace approved courses will also receive certification and training in the usage of AED’s. The 4 level’s available through Victoria First Aid include CPR “A”, “B”, “C” and “HCP”. For more information about the featured stand-alone CPR courses or to register visit our CPR course page. Victoria First Aid is a proud provider of the highest quality first aid, CPR and food safe programs at the most competitive prices. We are dedicated to having the most experienced and knowledgeable instructors. Our training facilities are conveniently located throughout Victoria and provide a comfortable learning atmosphere. We feature the latest training equipment in convenient and well maintained facilities. Victoria First Aid proudly has exceptionally high customer reviews with courteous and friendly staff. Numerous customer service representatives are available during regular business hours to help with any questions, concerns or registration problems / needs. Registration for any first aid, CPR or food safe course can be completed via our on-line registration program (found throughout this website). We also offer re-certification courses for participants that want to renew certificates. Other courses include pet first aid and CPR for individuals that want to learn basic rescue techniques for pet emergencies. If you have a question or concern about any of our programs feel free to use our “contact us” page to email, call or visit us. We look forward to teaching you. 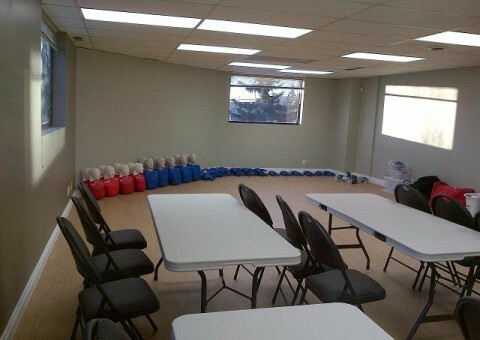 We offer a Number of different first aid training classes all of which include CPR and AED training. Participants that need to renew awards can take re-certification classes. Get certified with this BC Health Act approved course. I really enjoyed my class. The teacher was not only extremely knowledgeable but he made the class really fun. I learned a lot! Thanks Jeffrey! Jaime was a great teacher. You can tell he had a lot of experience and knowledge in the subject. I also got my certificate right at the end of the class (no waiting!) Great value for what I paid. You won't find anybody cheaper!